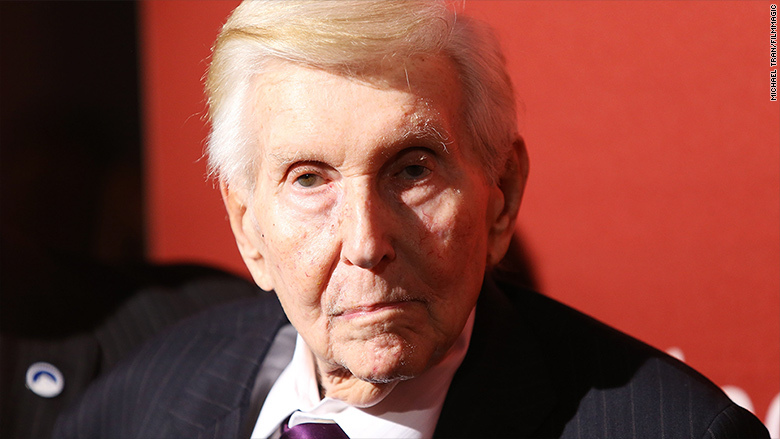 The long awaited trial to determine whether the 92-year-old media mogul Sumner Redstone was competent could be over in little more than a day. Judge David J. Cowan of the Superior Court of Los Angeles County said he would decide Monday whether to accept a motion by Redstone's attorneys to dismiss the case. Cowan's comments came after he listened to a video deposition of Redstone in which the chairman emeritus of Viacom (VIA) and CBS (CBS) struggled to answer questions at times, but repeatedly used expletives to describe his ex-girlfriend Manuela Herzer. Herzer, 51, has argued that Redstone was lacking mental capacity or was under undue influence when he ousted Herzer from control over his healthcare. According to a transcript of the video, Redstone was able to recall that he booted Herzer from his Los Angeles mansion, and clearly said the word "Shari" — the name of his daughter — when asked who he wanted to be responsible for his health decisions. Cowan said he would wait until Monday to respond to a motion by Redstone's lawyers to toss out the case, but acknowledged it was difficult for him to see how Herzer could be put back in charge of Redstone's health care. "Mr. Redstone did state that he wanted his daughter Shari Redstone to look after him," Cowan said. The judge added, "If people don't want to live with each other, they don't have to live with each other." Herzer's lawyer Pierce O'Donnell argued that Redstone had been "brainwashed." Cowan asked both sides for further evidence over the question of "undue influence," and would consider it over the weekend, and "have a decision one way or the other on Monday." Before Cowan's comments, Dr. Stephen Read, a psychiatrist who examined Redstone for Herzer's legal team, testified that Redstone's replies in the deposition were "stereotypical statements" Redstone made without seeming to think about them. In testimony that lasted well over an hour, Read described Redstone as "a very thin shadow" of his former self: suffering form dementia and delusions, completely unable to function on his own, and often angry or tearful at his physical and mental limitations. At one point, Read said that Redstone enjoyed betting on sports, but did not know who the teams were. So family members ensured Redstone won every bet by showing him prerecorded games, the doctor said. While the video of Redstone's testimony was closed to the press and the public, audio heard through the courtroom door indicated that the media mogul could barely articulate simple words. Often times throughout the deposition he was asked to spell the word he was trying to say. The questioning of Redstone was a key moment in a trial which could have major implications for his $40 billion media empire. Herzer's lawyers believe that Redstone's daughter Shari, the vice-chairman of both the Viacom and CBS boards, plotted to get Herzer out of the picture in order to shore up her standing as heir apparent to her father's empire. Redstone's lawyers argue that Herzer and Sydney Holland, another former girlfriend, took advantage of the aging media mogul in order to gain access to his wealth. A ruling by Cowan, who is presiding over a trial without a jury, that Redstone is incompetent would also open the door to a power struggle over control his media empire. A settlement with Herzer was agreed upon earlier this year, but collapsed, sending the case to trial.